The area of Stratford has gone through a massive transformation since the Olympics, Westfield is along with its shops as a lot of Halal restaurants to choice from, from the food court to the eateries that you can find outside in the mini street town. Among the restaurants is Cabana and Brazilian style BBQ restaurant with a very similar look a feel to Wahaca, which just happened to be next door. 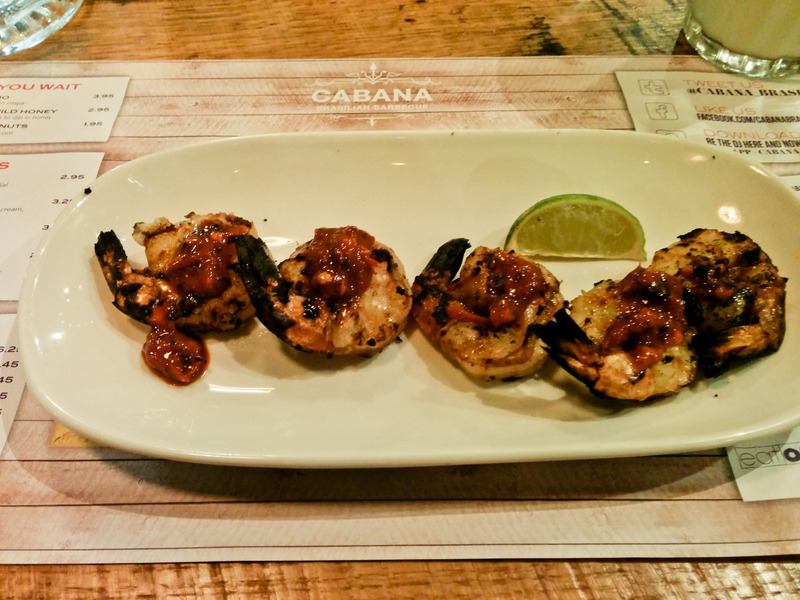 I came here on a Monday evening with a friend – I already knew that Cabana served Halal Chicken only, but it was also on tasecard which means 2 for 1 discount which is always a plus. The restaurant is colourful and has a very laid back casual atmosphere, staff where friendly and we were looked after. So, lets talk about the food. For Starters I went for the Spicy Malagueta Prawns (above), 5 grilled Atlantic prawns in a spicy Malagueta sauce, this was a really nice dish, my favourite of the night. For me; tasty food is spicy and full of flavours. The prawns where juicy and big and I really liked the sauce they where marinated in. 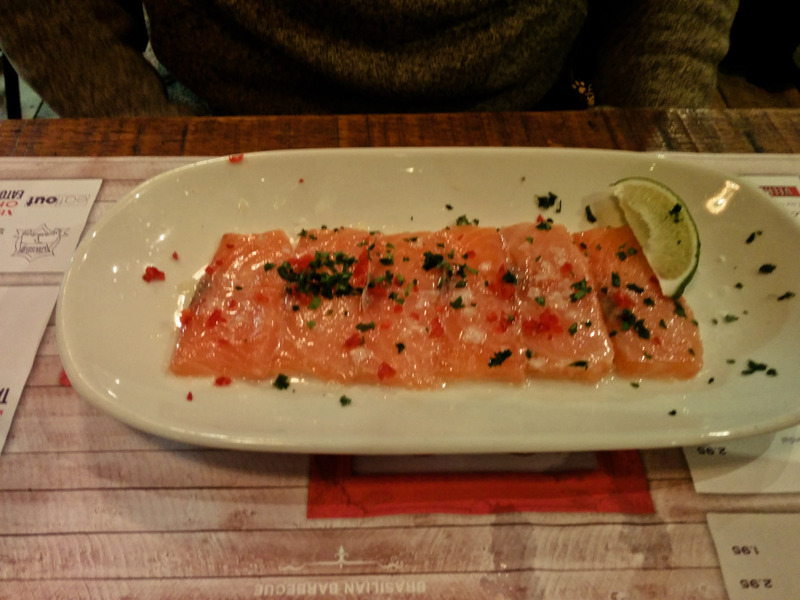 My friend ordered the Salmon Ceviche, Glad it was him that ordered it as it wasn’t as good as my lovely Prawns. So the “main” dish on the menu is the BBQ. Meat is skewered and cooked on the BBQ in the middle of the restaurant. 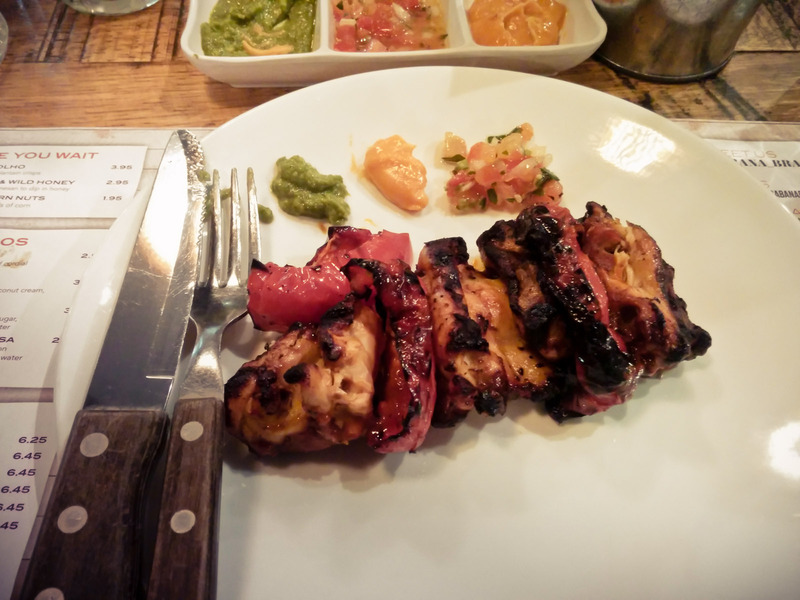 I went for the Malagueta Chicken (above) the food is served off a skewer that is brought from the BBQ to your plate. The Chicken was nicely cooked through, soft and tender, though it didn’t have the same kick of spice as the Prawns. I was a bit disappointed to find that all I got was just 4 pieces of BBQ chicken and some red peppers. I was hoping for maybe something to accompany the dish, like a side salad or something. Speaking of a lack of extras, you also have to PAY for sauces which is a bit cheeky, one sauce is .95p or any 3 for £1.95, and really, you get around a table spoon which is just not enough. My friend went for the Beirut (sounds Brazilian, right?) 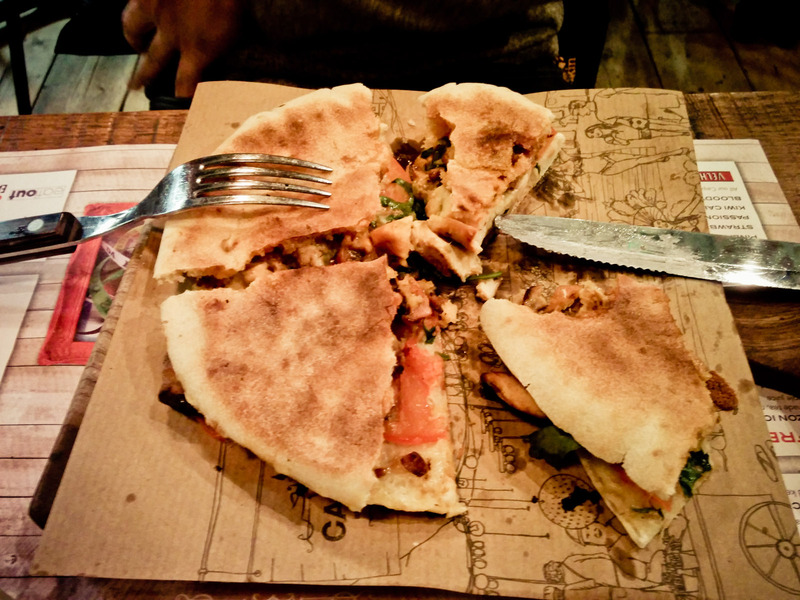 Which was a toasted Syrian flatbread filled with spicy Malagueta chicken, salad, chilli mayo and melted cheese. We also had a side order of sweet potato fries, these where well cooked and textured, just wish there was more of them! 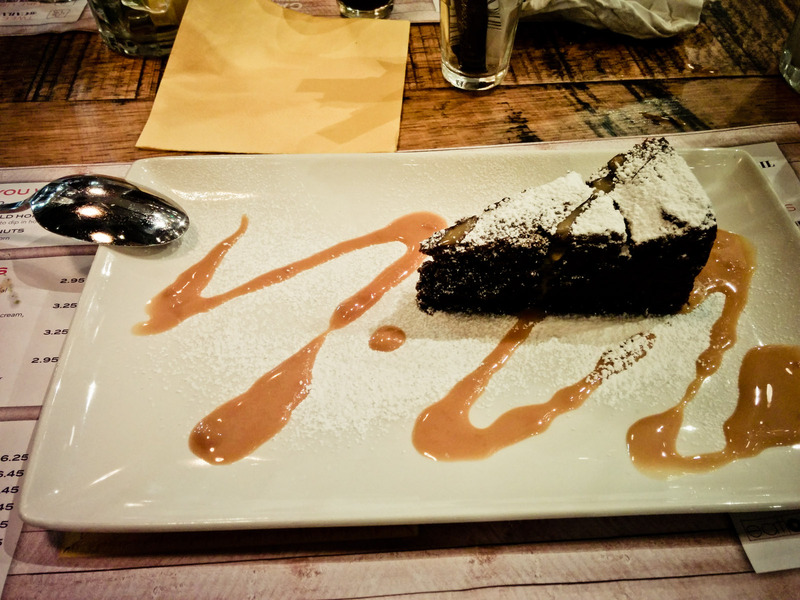 They had a decent range of Desserts, I opted for a Brazilian Chocolate cake, it was rich, dense and I liked the presentation, thumbs up for me. 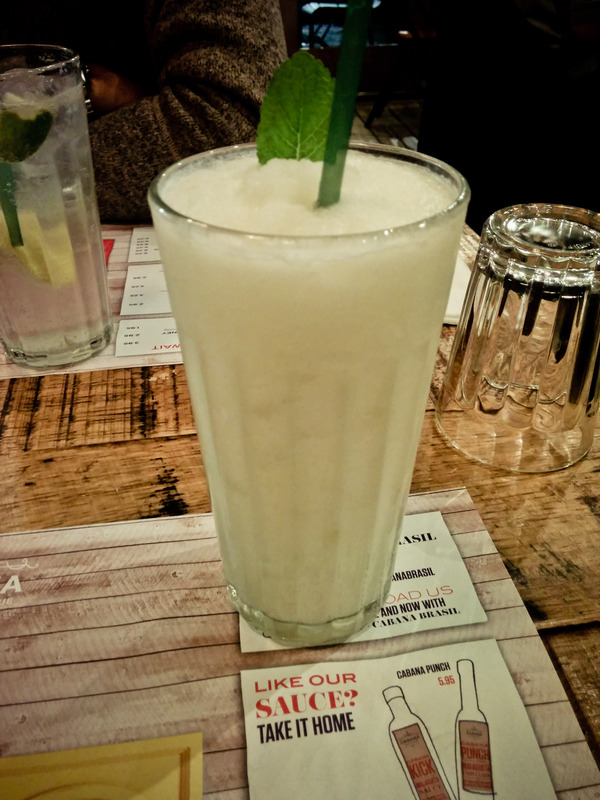 Drinks I had a Cool Colada, Fresh pineapple blended with coconut cream, coconut water and a hit of citrus and loads of crushed ice, in fact a bit too much for my liking, it felt like a slush after a short while.Cabana is a very casual eatery, with good atmosphere and friendly staff, the Halal Chicken is bonus, however I was left a little empty in the stomach with the main, not enough meat. Would I come here again? Yes I would, but without a tastecard I think it’s a bit overpriced. Total came to £16 per person, Drink, Starter, Main, Desert and Side. With TasteCard. This place surprised me. The spicy malagueta chicken burger was cooked well however it was lacking something, I stole a bit of my friend’s coconut slaw and put it in the burger and wow, it was amazing. I mean, slaw may not be everyone’s cup of tea but I recommend you try it. Hey Buddy!, I found this information for you: "Cabana, Stratford". Here is the website link: http://halalfoodguy.co.uk/cabana-stratford/. Thank you.